One of the more amazing and self-refuting things that Darwin's Cheerleaders will do is engage in prejudicial conjecture. That is, they have biased, uninformed opinions that they are willing to share as if they are imparting wisdom upon the unenlightened. Some even have the gall to tell us falsehoods about what we believe and teach, but never mind about that now. We see an excellent example of that in the article that follows. Dr. Terry Mortonson was giving lectures in the UK. He received an e-mail about how he was "misrepresenting basic science" and that he was wrong on so many things. Even more amazingly, the writer was complaining that Dr. Mortonson was not qualified to talk about his topic, and the writer was unqualified in the area — but Mortonson was still wrong! 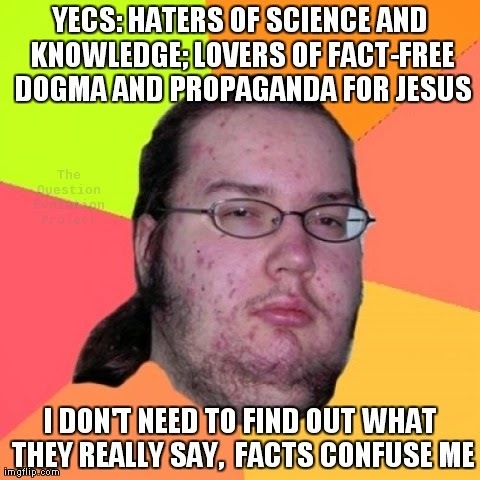 He provided links from a highly biased and inaccurate evolution propaganda site (faulty appeal to authority) to prove him wrong. All this from someone who did not bother to attend any of the talks! Still, Terry took the time to use logic and science to give the guy something to think about. I appreciate that you admit that you are really not qualified academically to comment on the subject of my lecture. But one does not have to be an expert to critically evaluate the arguments, if one reads both pro and con arguments by competent representatives of the positions being discussed. Furthermore, since both creation and evolution accounts of origins touch on many disciplines of science and since scientific information has become so massive and scientists have necessarily become so specialized, there is a sense in which no one is qualified to evaluate any arguments. Everyone (evolutionist or creationist) has to trust experts outside their own narrow field of expertise. But let me respond to at least some of your objections since you made an effort to write them up. To read the article in its full context, go to "Fossil Evidence of Whale Evolution?"